The time is right for a new movement. The American middle class is sick and tired of getting trampled by the well connected who have our government by the balls. But if we are going to get this baby off the ground, we’re going to have to do this right. Successful movements have certain things in common. Timing is important. But so is critical mass, messaging, leadership, discipline. To start off our exploration of movements that worked, I want to start with The Protestant Reformation and the American Revolution. Those of you who haven’t seen HBO’s fantastic series John Adams should rent it ASAP. The first several episodes are the important ones. For those of you not familiar with the Reformation, check out this excellent introduction from PBS’ Empires based on the life of Martin Luther: Driven to Defiance and Reluctant Revolutionary. Now, before we get started, I would like to conduct a survey. This is not the first time we have tried to get our act together and we are not the only ones trying to do it. Violet Socks is testing the waters as well. But we continue to face resistance, from ourselves mainly, to actually doing something. So, this survey is intended to help us figure out what we are doing wrong. Those of you who are hankering for a National Womens Party should give it up. It’s DOA. If you go that route, you will end up marginalizing yourselves and leave the rest of us without your critical mass. Seriously. I don’t want to be a part of a movement where we are already starting down the path to splitting ourselves up. You can get everything you want from a new entity without making yourselves irrelevant from inception. Sorry to be so harsh. I could be harsher. I am a feminist interested in equality. Sentimental feminism bores me to fricking tears. Don’t test my patience. Feel free to disagree with me but before you do, first do a thought experiment and carry out your proposal to its logical conclusion. Yes, tea partiers are well intentioned but crazy. If you are a tea partier, I share your frustration with the way things are. But the tea party movement was started by Republican operatives and, I’m sorry, but Republicans have lost all semblance of credibility. They are bent on destruction of our government and have been successful at destroying it since Ronald Reagan got his mitts on it. Rush Limbaugh is an evil man. Glenn Beck is both evil and stupid. If you can’t see what is really going on in the tea party movement, please sit this one out on our threads. Think about how to spread the message once we have one. Blogging isn’t the answer. Most people don’t read blogs. Also, the news media isn’t going to cover us until we are too obvious to ignore anymore. THIS is the place to be creative. The movie is based on the book by David McCullough. (Highly recommended. I bought it for the BFF for Christmas several years ago but *I* read it first.) John Adams was a motivating force in the separation from England and writing the Declaration of Independence. Oddly enough, he wasn’t heavily involved in writing the constitution, at least, not as involved as James Madison and others. Adams was off in France during much of that period of time, serving as our Secretary of State of sorts. So, much of what the Constitution is based on is the Federalist Papers. It might be a good time to revisit those papers because if I recall my poli sci 101 correctly, the Constitution was written in part to protect the rights of property owners from the effects of mob rule. Yes, our founding fathers were liberals, up to a point. In any case, we will be discussing some of the outcomes of Federalism and its effects in modern politics in the days ahead. Expect “Federalist” to make a repeat appearance in our posts. But does that word mean what people like Supreme Court Chief Justice John Roberts think it means? And what does Barack Obama have to do with Federalists? ‘m bringing this up because this is what I think separates Clinton supporters from Obama supporters. Obama supporters are jumping to the top of the pyramid. They are ready for self-actualization and Obama encourages a higher level of thought in them but he skips the stuff below the top. That will require negotiation and further planning. Hillary voters prefer working our way from the bottom up because we know that unless you stabilize the bottom layers, you can not reach the top. There are no shortcuts. 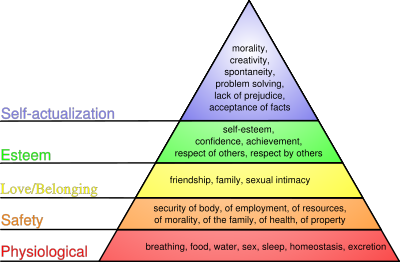 After Bush, we will be left with a pyramid that will have a bottom layer completely undermined. He and his friends have robbed us of the resources to keep the lower layers stable. And this is where I think Obama supporters are in error. Because once in office, Obama will be so consumed with reinforcing the bottom layers that he may never get to be that inspirational leader of self-actualization. Hillary may never get there either but by the end of her term(s), we will be ready for Obama. By the way, that doesn’t mean I don’t think Hillary is incapable of bringing us to the top of the pyramid and leading us to greatness. It’s just that realistically, the job this year calls for a worker, an architect, an engineer. Not a dreamer. To Adams it was safety and political stability first, followed by ensuring prosperity, followed by the fruits of the mind at leisure. OK, now I really DO have to work. Ta-ta for now.